We spoke to Nina, our Finance Assistant to talk about our move from Sage 50 to Sage Live. Nina has always worked with Sage 50, we thought it would be great to get her thoughts on upgrading to Sage Live. 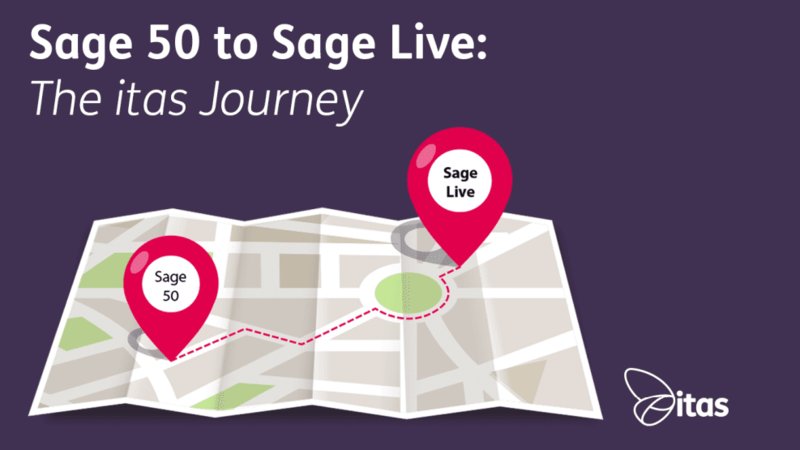 Well – I’ve used Sage 50 for a number of years across a couple of different roles so when I started at itas and learned that we were going to move over to Sage Live I was intrigued and very keen to see what it is all about but also a little dubious as I am well and truly in my comfort zone with Sage 50. The main issue for me at work is time – it can be a challenge to keep on top of everything. Getting to grips with a new system can obviously take time, especially when it is so different – meaning that initially I won’t be able to speed through the tasks that I am currently confident with on Sage 50. However – on a positive note in the long term (once I’m familiar with Sage Live!) the automation of some of the more mundane tasks should hopefully free up time – woo! What features are you excited about in Sage Live? As it is now I manage all of our contracts on Smartsheet and have reminders set when I need to invoice – Smartsheet is a great tool for this task but I’m hoping Sage Live will be even better when everything can be maintained in one location. Once all of our contracts are entered onto Sage Live I believe we can automate a number of the tasks including invoicing and also reconciliation and visibility on profits etc. should be much better as all information will be in the same place rather than across several applications. Again – I think that many of the repetitive tasks that I now complete manually can be automated on Sage Live. I currently have invoices, such as monthly subscriptions set as recurring items on Sage 50. Recurring transactions are a priceless feature on Sage 50 – it saves so much time not having to manually enter recurring invoices but I believe this will become even easier on Sage Live which means I can use my time even more efficiently – win win! What are other parts of the organisation excited about? The ability to access real time data on the move seems to me to be one of Sage Live’s winning features. It is going to be great for our decision makers when they are on the road. They will have accurate information to hand which will give them the freedom that is so often unavailable with other accounting systems. If for instance a client advises them that they have made a payment the guys on the road will be able to check for themselves without having to call the office to get confirmation from the Finance Team – the information will be accessible on their mobile device! This also applies to reporting – it can be quite a lengthy process ensuring everything is up to date on Sage 50 so it is not always possible to obtain real-time information on the spot. We will have a better overall picture of how itas is performing financially at any point in time without having to compile and export reports manually from Sage 50. I think that when we move over to Sage Live it is going to have a huge impact on both itas as a whole and my working days, it is going to be very different so good bye comfort zone but it will be different in a positive way in my opinion. Although I have a lot to learn, I couldn’t be better placed to receive top quality training from our Sage Live Team could I?! I am open to change and willing to learn new ways of doing things, especially when it’s something that will eventually free up a good percentage of my time once I’m confident with Sage Live. Who doesn’t love the idea of becoming even more efficient? How about you? Have you already made the transition across to Sage Live from another application? What were your thoughts? I’ll know more once I’m up and running with Sage Live, personally I learn best when I’m actually using something. Watch this space and maybe I’ll update you guys once we have completed the move! Nina is our Accounts Expert! Super organised and as tenacious as they come, Nina is Chief Organiser when it comes to team nights out. With three young children, she is a superhero both in the office and at home.